SPIbelt Running Belt 4 LegallyFit Rating It seems like everyone nowadays is running with their phone. Long gone are the days where you carried an iPod just for running and a separate iPhone for phone calls. The hardest part about running with a phone? Finding a way to carry it! In the past I have tried just about everything – clunky fanny pack style bags (it was cute, let me tell you), armbands that slid down when I ran (that wasn’t distracting), hip clips… I could go on for hours, but I will save you. Last year I found my one true love when it comes to running, the SPIbelt. I can carry my phone on my hip in this pouch and even my keys when I run. There is even a large pocket SPIbelt for those iPhone 6 Plus users and carriers of excessively large “tablet phones.” If you are running in a race, you can even pin your number to your SPIbelt. So far I have worn my SPIbelt during a 200 mile Ragnar Relay, three successful half-marathons, countless 5k races, and on daily runs. It has held up for over a year and still is my favorite piece of running equipment (not that much is needed to run). It does not bounce while I am running and is completely adjustable for comfort. 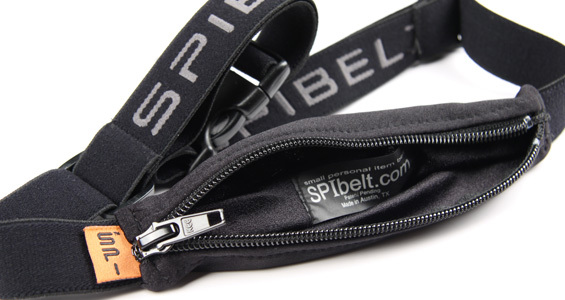 Plus it isn’t limited to land, SPIbelt now even makes a waterproof accessory so that surfers can use it. Next time you are in the market for a way to carry your phone while running (or surfing), try out the SPIbelt – I love mine. The expandable pocket allows you to comfortably carry your keys, phone, and wallet with you when you run.